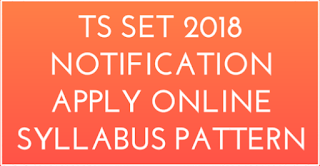 TS SET 2018 Notification Released On Released on 08-03-2018 and Online Applications Start From 14-03-2018. Applications are invited by the osmania university from eligible candidates to appear for the Telangana State Eligibility Test(TS SET-2018) To be Conducted on 15-07-2018. 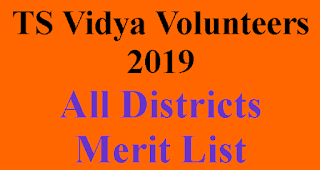 For Details see the information Provided in www.telanganaset.org from 12-03-2018.
d. Ph.D. degree holders whose Master's level examination had been completed on or before 19th September 1991 (irrespective of date of declaration of result) shall be eligible for relaxation of 5% of marks from 55% to 50% to appear in the SET Examination. l. Candidate who became eligible in earlier APSET-2012, 2013 and SET-TS&AP-2014 are not eligible to apply again in the same subject. 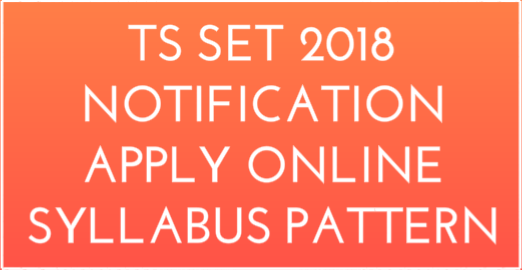 If any candidate found to be eligible in Previous SET tests and reappearing for the current TS-SET their candidature will be cancelled and the previous eligibility is withdrawn through de-notification. 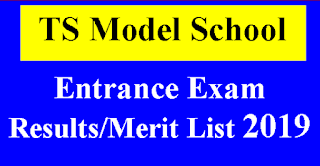 Syllabus and Question Paper for TS-SET:As per the UGC guidelines the CSIR/UGC-NET syllabus has been adopted for the conduct of TS-SET for all the 29 subjects for which accreditation is given by UGC.